What a picturesque setting for a Hunter Valley lunch, or dinner for that matter! Our visit to The Verandah Restaurant proved to be a delicious treat for our taste buds. Tapas is what it’s all about at The Verandah and we sampled some of their favourites as recommended to us by chef, Tim Suffell. 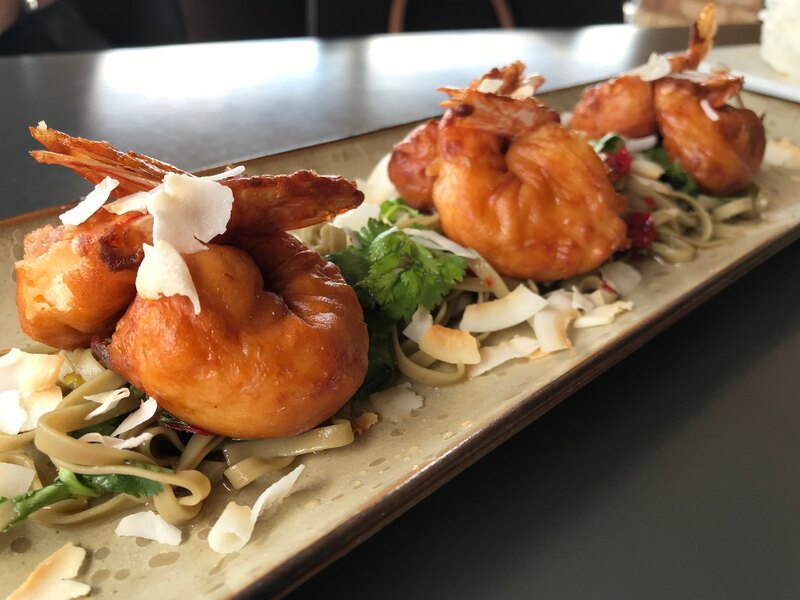 Our stand out dishes were the coconut battered Australian prawns with green tea noodle salad and nam jim dressing and the smoked ham hock, pea and three cheese croquettes with pimento rojo sauce. We also sampled the Brie fondue with toasted nuts, cranberries and croutes and Sheftalya, a pork belly sausage with grilled Cypriot haloumi and vodka dill salsa, which were also very tasty. Our chosen dishes offered just the right mix of flavours and were the perfect serving sizes as they cater these specifically to your group size, so no one misses out which can sometimes happen with Tapas style dining. Paired with some delightful Hunter Valley wines, this dining experience is satisfyingly different so grab a table on the shady Verandah next time you visit the Hunter!